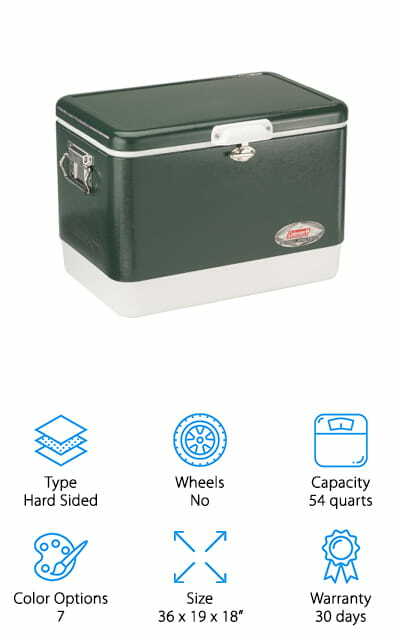 There are so many options for coolers that you can take camping with you that it’s hard to decide. That’s where we come in! We’ve compiled this buying guide in order to bring you our recommendations for the best cooler - no matter what type of cooler that you need. Of course, different styles of camping need different products. We’ll get into that after we tell you what you’ll need to know to start shopping. Type: There are many different types of coolers, but most will fall into two categories. Either they’re going to be soft-sided coolers or they’re going to be hard-sided coolers. Soft-sided coolers are portable, but hard-sided ones keep things colder longer. Wheels: No matter what time, having wheels on your cooler can make all the difference. Who wants to lug all that weight, including ice and drinks and food, around the campsite? Wheels make the whole process a lot easier. Capacity: How much can the cooler hold? This is measured in quarts and gives you a good idea of how much you can put in the cooler at one time - not what will stay cold, but how much will actually fit. Color Options: This is the number of colors that the coolers come in. It’s important to some people that their gear matches or they want a color that isn’t going to show dirt easily. Options matter, so choose your favorite! Size: The dimensions of the cooler can tell you a lot of information about where it’s going to fit and how much. Drinks will take up more space than snacks, but you need to have the room in your trunk. Warranty: If your cooler has some sort of manufacturing defect that prevents it from functioning properly, you can return it within the warranty period to get a refund or replacement cooler at no additional cost to you. With that out of the way, we can get down to showing you our best cooler reviews! We’ve looked through tons of coolers to bring you a selection of the very best. If you’re in a hurry to get out to your campsite, take a look at our top pick and budget pick first. But don’t forget to look at the rest of our list, because we’re sure that your next camping cooler is here somewhere! The Hopper Two by Yeti is one of the best soft-sided coolers that we could find in our research. 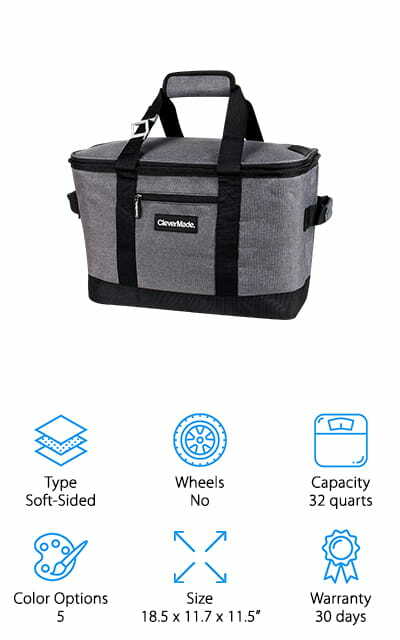 It has the capacity to hold 40 pounds of ice if ice is all you’re carrying, and can hold it longer than just about any other cooler on the market despite being soft-sided. It’s easy to load and unload, and it’s more comfortable to haul due to the tapered body style, where it’s thinner at the top and all of the weight and thickness is at the bottom. The shell is waterproof and won’t let any weather get into the contents. You can conceivably take it anywhere without compromising your drinks and snacks. The zipper is the same model that they use on hazmat suits, so you can rest assured that nothing is getting through it. Pair all of this with a stylish design that’s easy to carry, and this is one amazing bag! Our pick for the best car cooler for the money comes from Coleman. A well-known name in the outdoor world, Coleman is known for creating quality products at an affordable price. 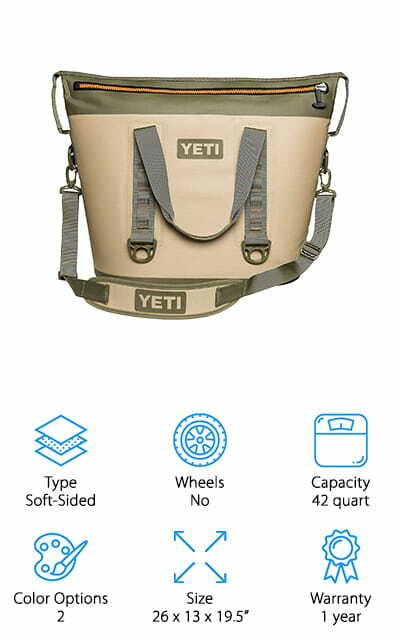 This particular soft-sided cooler comes in five different colors, including a camouflage option. It’s easy to clean and can hold up to 16 cans – which makes it a great in-car companion. Ice keeps for a long while so your drinks and snacks will stay chilled. The hard plastic liner that gives the bag its shape can be removed easily. The soft liner on the inside is PEVA, so it’s soft and made to be in contact with food. What’s even better is that there are built-in antimicrobials on this liner. The small size of this cooler makes it great as a car cooler, and holding 16 cans at a time is no joke! It comes in a variety of color options, which includes blue, grey, red, green, and camo. This collapsible cooler by CleverMade is one of the best cooler backpack-type pieces of gear that we’ve ever seen. Load in about 50 cans and ice into this great big cooler bag and help it snap into place so that you can get the best out of this product and it won’t collapse. The interior is leak-proof so all the cold stays in the bag! The exterior is rip-stop material so it’s durable and won’t scuff as easily. Though this looks like a pretty big cooler, it can collapse down to 3 inches in a pinch, which is another reason this is an amazing cooler. It’s comfortable to carry, and even the best-wheeled coolers can’t compete with the easy transport. It can hold an amazing 50 cans plus the ice to keep them chilled without breaking a sweat, and when it’s done, it collapses back down to 3 inches! 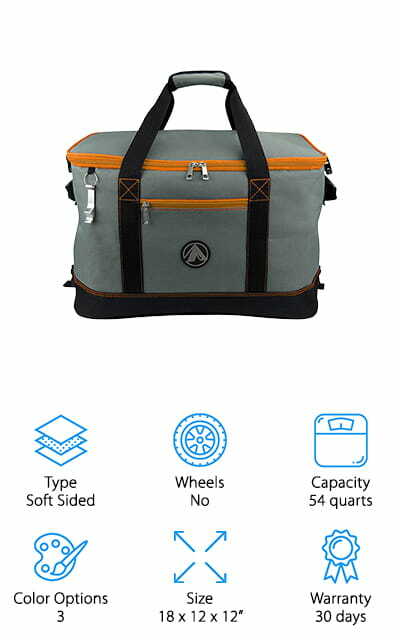 It even has a front pocket for your personal effects! This Coleman Cooler is the first hard-sided cooler on our list! This makes it our choice for one of the best beer coolers that we’ve presented to you. It looks like it came straight out of the 70’s, which is a nice touch. The insulation on the inside of the cooler boasts that can keep ice for a total of 4 days in 90-degree heat! That’s pretty amazing! It’s made of stainless steel, so it’s rust-resistant and will keep going for years of camping trips to come. The 54-quart size is pretty amazing and can hold up to 85 cans at a time. Take it to your next tailgate or outdoor party to become everyone’s new favorite person. The handles are comfortable to use, even when the cooler gets heavy. It’s still super easy to lift and carry it. And the lid is also a seat! How cool is that? We love everything about this cooler! Igloo is one of the first names that comes to mind when you think about purchasing a new cooler, and for good reason! 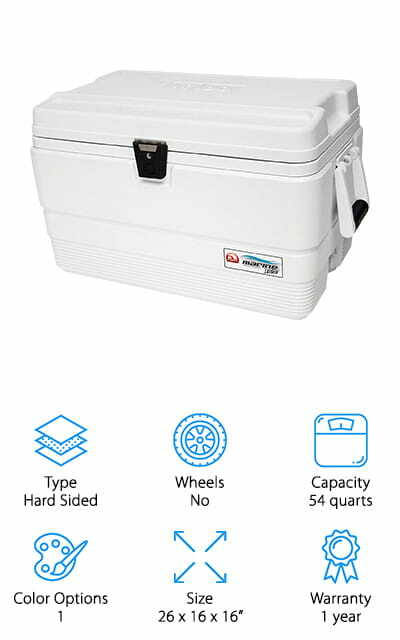 This particular 54-quart cooler is insulated in both the body and lid so that it can keep ice frozen for up to five whole days. That’s impressive! This is due to an Igloo-patented technology called Ultratherm. It has UV inhibitors built-in so that it isn’t going to be damaged by the sun, and all of the metal on the cooler is made of rust-resistant stainless steel – even the hinges and screws! The drain plug is threaded so you can hook up a hose and drain it so much easier as well. And the best part is that it’s big enough to hold up to 140 cans. Perfect for tailgating, and when you go to move it, it has reinforced grips. It also comes with a fish-measuring ruler in the lid. Perfect for fishing! This Topanga tote bag cooler is one of the best soft coolers that we’ve seen on our list. It’s stylish, for one, so everyone can enjoy hauling around refreshments! There are dual-carry handles so that you can easily get it from place to place, as well as an interior that is lined and perfectly sealed so the heat isn’t going to get in and the cold isn’t going to get out. It’s great for any of the outdoor activities that make you want something cold to drink! There is a pocket on the outside, even, that allows you to keep your phone and keys out of your way and secure. 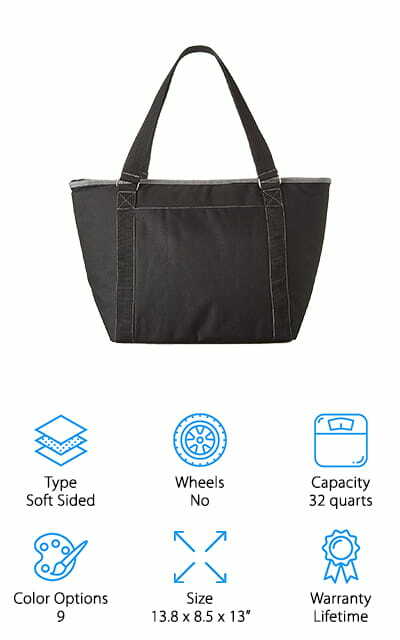 There’s a lifetime guarantee that it’s going to work, and we personally love the idea of a giant tote bag as a cooler. It is sophisticated and still extremely functional, and can hold up to 24 soda cans and the ice to keep them cold. 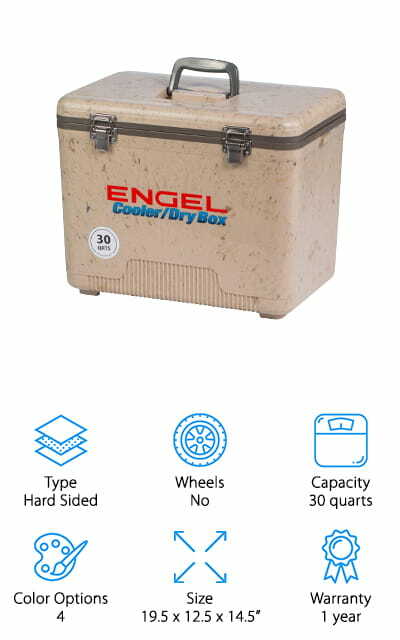 This Engel USA Cooler in a smaller size might qualify as the best car cooler that we have seen yet. Though it is a hard-sided cooler, it’s been insulated with molded polystyrene foam that keeps everything inside cool. Foam coolers work well for a while, but a foam cooler resting inside a rugged case that provides an extra layer of protection is sure to keep your refreshments nice and cool for a long time. There are shoulder straps and tie-down guides in case you need to attach it to the back of your rig or the roof of your car, which is extremely helpful given the size. The latches are made of high-quality rustproof stainless steel that will hold no matter how often you have to get into the cooler. It’s a solid product that works as intended, at an affordable price for a 30-quart cooler. What more could you ask for from a camping cooler? 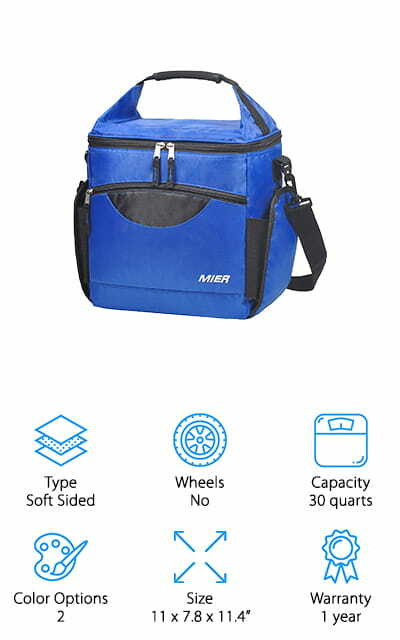 Even the best cooler backpacks aren’t as easy to carry as this MIER soft cooler. 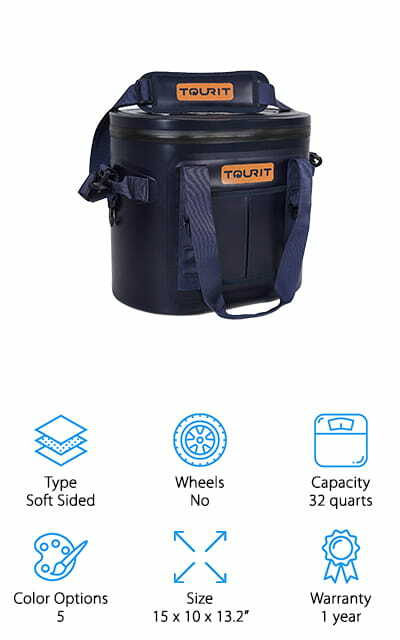 This large 30-quart cooler is lined with thermal insulation that is thick and meant to keep all of the heat out and the cool air generated by your ice inside – where it can do the most good. The seams are heat-welded so there is an additional layer of protection outside of the PEVA lining. Nothing is getting in or out of this cooler that you don’t want there. There are two side Velcro pockets that we absolutely adore, as well as a front zipper product for personal effects. It can hold up to 25 cans and makes a great cooler for lunch at an outdoor job. It’s simple, but it works! What stands out to us is the easy carrying system – you can use the handle at the top or the soft, padded shoulder strap that you can adjust and remove. This collapsible cooler by GigaTent is durable and will keep all of your refreshments cold for hours on end. It’s got a light fabric on the outside and thick insulation on the inside! You can hold 48 cans in this huge cooler, and what’s even better is that when you’re done with it, you can store it without any additional hassle by collapsing it to tuck it away. The 600D polyester fabric on the outside of this cooler is resistant to tears and remains lightweight while not sacrificing durability. It zips at the top for easy top-loading, and it even comes with a removable metal bottle opener – because no one wants to get caught on game day without it. 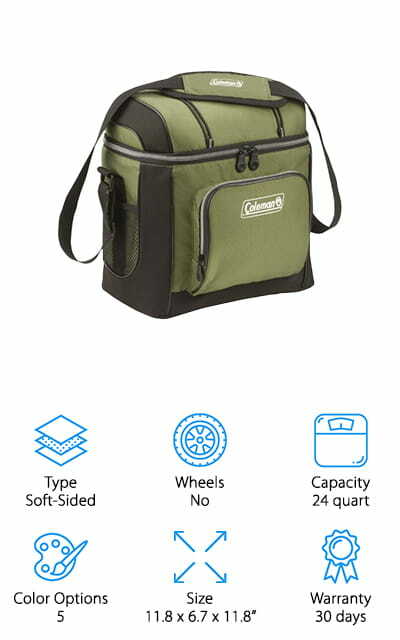 It’s great for travel and the outdoors, as well as any other recreation even you’d usually take a cooler too! We love how much space is in this large 54-quart cooler and how easy it is to move as well! The last cooler on our list is this soft one from TOURIT. There are five different color options to appeal to your sense of style, but that isn’t all there is to see here – this cooler is a powerful, constant companion that will never let you down. Keep food and drinks cool up to three days due to the unique layers of insulation in the walls of this cooler. It won’t sweat or leak at all and will keep all of the cold inside and the warmth outside. The zipper is airtight, so nothing is going to get out through there, either. You can use the shoulder strap to carry it, the top handles or the reinforced side handles – depending on how full you have it. Not to mention that it’s a great price and a 3-year warranty to make sure that you love the product. It’s big enough to hold 20 cans but small enough for the trunk!